In the next several days I will be reviewing the page proofs of my forthcoming book The Redistribution Recession. You can pre-order a hard cover version with color charts, including shipping, for less than $35!! That's so cheap that you'll want to order one for home and another for the office. Redistribution, or subsidies and regulations intended to help the poor, unemployed, and financially distressed, have changed in many ways since the onset of the recent financial crisis. The unemployed, for instance, can collect benefits longer and can receive bonuses, health subsidies, and tax deductions, and millions more people have became eligible for food stamps. Economist Casey B. Mulligan argues that while many of these changes were intended to help people endure economic events and boost the economy, they had the unintended consequence of deepening-if not causing-the recession. By dulling incentives for people to maintain their own living standards, redistribution created employment losses according to age, skill, and family composition. Mulligan explains how elevated tax rates and binding minimum-wage laws reduced labor usage, consumption, and investment, and how they increased labor productivity. He points to entire industries that slashed payrolls while experiencing little or no decline in production or revenue, documenting the disconnect between employment and production that occurred during the recession. The book provides an authoritative, comprehensive economic analysis of the marginal tax rates implicit in public and private sector subsidy programs, and uses quantitative measures of incentives to work and their changes over time since 2007 to illustrate production and employment patterns. It reveals the startling amount of work incentives eroded by the labyrinth of new and existing social safety net program rules, and, using prior results from labor economics and public finance, estimates that the labor market contracted two to three times more than it would have if redistribution policies had remained constant. 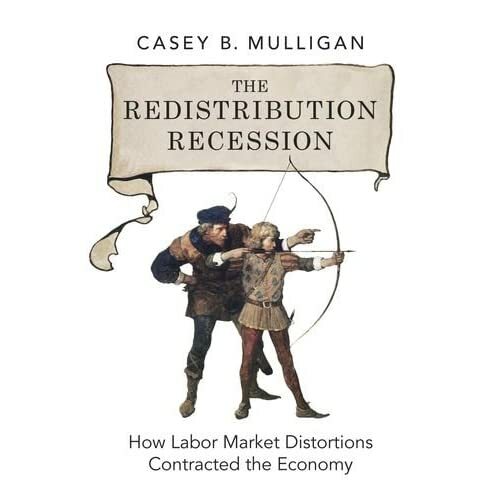 In The Redistribution Recession, Casey B. Mulligan offers hard evidence to contradict the notion that work incentives suddenly stop mattering during a recession or when interest rates approach zero, and offers groundbreaking interpretations and precise explanations of the interplay between unemployment and financial markets. I understand that physical copies are scheduled to ship from the press' warehouse on October 4 ... a week or two after that, the book should be available for immediate purchase. Who Cares about Fed Funds? New research confirms that the Federal Reserve’s monetary policy has little effect on a number of financial markets, let alone the wider economy. Politicians, and a few economists, have been imploring the Federal Reserve to help the economy grow before November. But the effects of monetary policy on the wider economy are small. The Federal Reserve and especially its regional bank in New York are actively engaged in buying and selling Treasury securities, and the Fed lends money to banks. These transactions influence the rate charged on overnight loans among banks, which is known as the federal funds rate. Because interest rates are important to homeowners and businesses, it is tempting to conclude that the Federal Reserve affects the economy by affecting interest rates. But the federal funds rate is only one of many interest rates in the economy, and it is those other interest rates that households and nonbank businesses pay as borrowers and receive as lenders. Yet a few economists have concluded that today’s exceptionally low interest rates on federal funds have turned our economy upside down, so that policies like unemployment insurance that pay people for not working these days actually get people back to work. A 1983 study by Lars Peter Hansen of the University of Chicago and Kenneth Singleton of Stanford showed that short-term rates on Treasury bills and short-term returns on stocks traded on the New York Stock Exchange had very little correlation with consumer spending. Many empirical studies have confirmed this sort of result (this comparison of inflation-adjusted Treasury bill returns and business sector profitability is a recent example). Nevertheless, a few economists working on the relationship between short-term interest rates and the economy still assume that consumer spending closely follows those rates (see, for example, the bottom of Page 5 of this paper). Their assumption can be useful for exploring other issues, so long as we keep in mind that the close relationship between short-term interest rates and consumer spending is their assumption, rather than a conclusion or an empirical finding. For a number of reasons, consumer spending, growth of gross domestic product and other important indicators of economic activity might be weakly correlated with the federal funds rate. For one, much economic activity — such as the many employees working for small businesses — occurs separately from financial markets. It is also easy to exaggerate the linkages between various financial markets. Eugene Fama of the University of Chicago recently studied the relationship between the markets for overnight loans and the markets for long-term bonds. He found that Federal Reserve policies had an obvious effect on the federal funds rate and perhaps also on rates on commercial paper (the market for large short-term loans to businesses). But Professor Fama found the yields on long-term government bonds to be largely immune from Fed policy changes. For all these reasons, the right explanation for the failure of our economy to rebound from the 2008-9 recession lies far beyond the market for federal funds. Recent empirical research shows that prediction markets yield high-quality predictions about future events. A prediction market is a market in which participants bet on a future event. The outcome of the event determines winners and losers, and pre-event prices in the market reflect participant expectations. For example, markets on the outcome of the 2012 World Series suggest that the Chicago Cubs have about a 1-in-1,000 chance of winning. Large prediction markets exist for political events, economic statistical releases and corporate events (such as company sales results), to name a few. Economic reasoning alone is unclear as to the relationship between prices in these markets and the probabilities of the outcome of events they are supposed to predict, and unclear as to whether the markets will be successful in terms of sustaining participation. Ultimately, that’s an empirical question, not a matter of economic reasoning. The efficient-prediction perspective says prediction market prices should be close to the probabilities or expectations of the featured events because market participants receive clear and direct monetary rewards for accurate predictions (winning their bets) and monetary penalties for inaccurate predictions (losing their bets). These penalties and rewards give market participants incentives to gather information and form the best prediction they can. The efficient-prediction perspective does not say that markets are a flawless crystal ball. For example, the Intrade betting market was saying that the Supreme Court was only 25 percent likely to uphold the mandate portion of the new health-care law, which the court did uphold. That market never said that the ultimate outcome was impossible, just one-third as likely as the alternative. Paradoxically, a prediction market cannot succeed unless it multitasks – it must serve an additional purpose separate from predictions, so that the participants with information about the outcome have counterparts to take the other side of their trades. In the case of sports and political markets, that additional purpose is entertainment – people enjoy engaging in the activity and are willing to participate even if their expected profits are zero or negative. These people are participating for various reasons other than prediction. (It is sometimes said that Las Vegas-type sports-event betting markets, such as the one that produced the odds on the Chicago Cubs, are not pure prediction markets because some participants are bookmakers and others are casual bettors, so the odds do not reflect precisely how the money is bet. But that’s my point: successful prediction markets do not consist solely of insider traders). The entertainment and other nonprediction functions of the market will also be reflected in the market prices, so they no longer solely represent probabilities or accurate expectations. For example, sports fans may enjoy cheering for the home team and in doing so might place more entertainment value on a home-team bet. If so, market prices may reflect not only the home team’s probability of winning but also the magnitude of the entertainment value. The market for United States government bonds offers another example. The prices of those bonds, especially the gaps in prices between bonds with and without inflation-indexed payouts, reflect market expectations about future expectations. But the prices may also reflect changes in the value of other rewards to market participation, such as liquidity or the satisfaction of regulatory requirements. The relationship between prediction market prices and event probabilities is therefore an empirical question, requiring many events in order to compare market predictions with alternatives. The economists Erik Snowberg, Justin Wolfers and Eric Zitzewitz have conducted a number of empirical studies and summarized them in a recent paper. They find that market prices more accurately predict events than do professional forecasters and polls that are often given authority in assessing the likelihood of various outcomes. In many cases, poll results and professional forecasts offer no information about event outcomes beyond what is already reflected in prediction market prices. The stimulus effect of government spending depends very much on the composition of that spending on purchases and on transfer payments. Government spending on military personnel and purchases of military equipment vary considerably over time and across different countries. As a result, a number of studies have tried to estimate the effects of military spending on employment and gross domestic product. Prof. Robert Barro of Harvard has worked years on this topic, with his most recent estimates prepared with Charles Redlick in 2009. They find that military purchases reduce the size of the civilian economy, but the civilian reduction is less than the military expansion, so the net result is a larger economy. Another way to look at it: some additional military resources come from the civilian business sector, but the rest comes from people and materials that would be not be engaged in the economy at all. By the same logic, government spending on road building, scientific research and other projects could expand the economy, although in the process they might reduce the size of the private sector. Perhaps road building and scientific research would even expand the economy in the long term as they made labor and capital more productive. 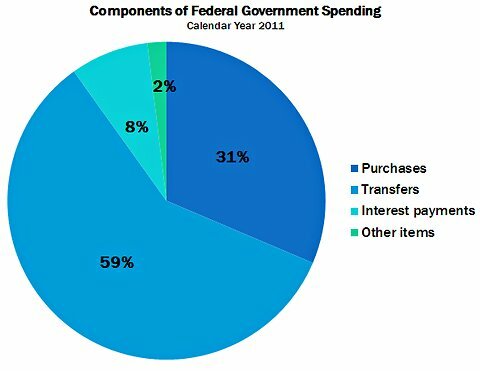 However, government purchases are a minority of federal government spending. The rest consists largely of transfer payments and interest payments on the federal debt. For example, the federal government spent $3.9 trillion in calendar year 2011, of which $2.3 trillion was on transfer payments such as Social Security benefits, unemployment insurance and food stamps. At first glance, there would appear to be little economic difference between government purchases and transfer payments, because in both cases the government writes a check, so to speak. When the check goes to a person for helping to build a fighter plane or highway, it’s called a purchase; when the government writes a check to an unemployed person it’s called a transfer. In both cases, the government must tax or borrow to finance the payment. However, the economic effects of purchases and transfers are quite different. Government checks written for purchases of equipment, roads and so on are payments contingent on work and production: the people cashing the checks received them by virtue of producing something the government values. Moreover, all people use the roads, schools, parks and other projects built by the government without any assessment of their financial worth. In contrast, people cashing transfer checks are not required to produce anything in return – and, as with unemployment insurance, for example, receive them because they are not producing anything. People who produce too much are ineligible for such payments. Economists have found that the government gets roughly what it pays for. When it pays people to produce, a number of people accept that offer, and the economy is larger as a result. When government pays people for not producing, a number of people, in effect, accept that offer by working or earning less, and the result is a smaller economy. The American Recovery and Reinvestment Act included purchases and transfers (as well as so-called tax credits, which are another story, discussed in a previous post). The transfers served to shrink the economy, while the purchases may have pushed to expand it. On balance, that is why many Americans had trouble seeing much net economic expansion produced by the act.